I haven't been blogging about art because I find it difficult to look at art when it's this hot outside. The galleries I want to go to (as opposed to the behemoths with retail-quality a/c) can get pretty warm during these weather conditions. Here are some recommended actions, regardless of the heat. You should also check out what the other Culture Pundits bloggers are posting. 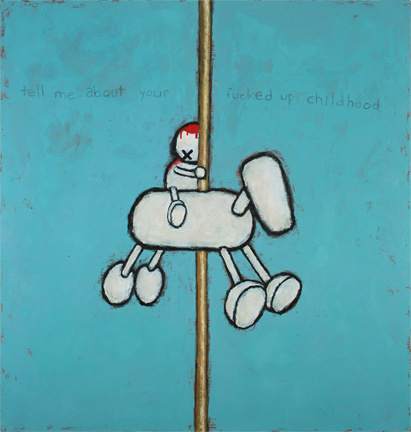 My work is metaphorical self-portraiture that addresses childhood emotions and trauma. Issues surrounding memory, family dysfunction and being adopted manifest strongly in my work. Children's books and television programs present a collective narrative in which grown-ups care for the best interests of their children. The pernicious disparity between this fiction and the brutal reality of childhood is the terrain I am most interested in exploring. I found him via the Culture Pundits Artists program. Listen to excellent music from Chiapas and Oaxaca via the widget below, or buy the CD. Go see the Joao Ribas-curated show at Andrew Kreps before it closes Friday. Attend Over The Opening on Friday, July 18th, from 7 to 10pm -- new installation by Dana Strasser and Isabella Bruno. Thanks for mentioning my work! Published on July 17, 2008 12:31 PM.